The Borough has investigated the problems caused by the vulture population in town. Council met with three personnel from the US Dept of Agriculture on February 23rd, 2012 to discuss vulture management practices and options for the Borough. The meeting included site visits to four vulture roosting locations in the Borough. USDA provided three options to the Borough at varying costs to encourage the vultures to move to other locations outside the Borough. Council worked with residents to harass the birds to encourage them to move outside the Borough. The Borough has purchased several pyrotechnic guns. These pistols shoot “screamers” to encourage the vultures to move. The use of firearms or pyrotechnics to harass the birds is illegal without a special permit from the Borough. The Borough could acquire a depredation permit to kill a select number of birds to use their bodies as effigies as another harassment technique. Unfortunately, the Borough has not received enough damage data from residents to justify the permit. Please contact the Borough to provide damage information, caused by the vultures, to help justify the depredation permit. Basic firearms safety is paramount. Follow all normal firearms safety precautions. Be cognizant of what is beyond or down range of where you are shooting. If there are houses and people, don’t shoot in that direction. The screamers don’t need to be aimed at the birds to be effective. The noise in the vicinity should be enough. Shoot up in the air, not laterally or downhill where hazards to people and property are increased. Realize that the screamers have small rocket motors and get very hot. They could start a fire if they land in the wrong environment. It is a good idea to have a small fire extinguisher on hand when using the pistols. Try to shoot them such that the used shells can be retrieved so as to not create a trash problem with neighbors. 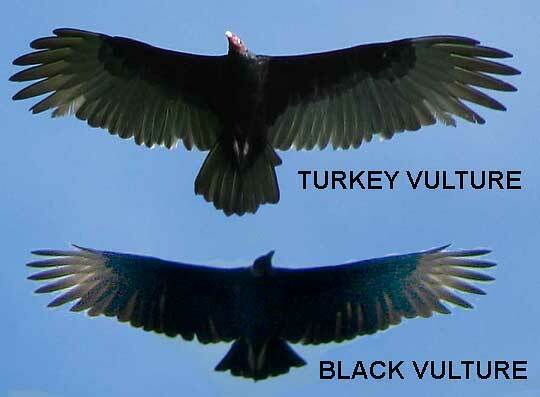 To learn more about the Turkey Vultures and Black Vultures, download these flyer’s from USDA: Vulture Fact Sheet & NWRC vulture brochure. WARNING: Vultures are protected birds and must be dealt with in accordance with Federal and State law. Do not take these matters into your own hands!